Mary’s intercession and mediation, therefore, are not only incomparably greater but incomparably different in nature from those of the Angels and Saints. The intercessions of all other Saints are only supplicatory in nature. Without Mary the Mother of the Incarnate Logos (Word), however, there can be no Saints. She is one of the two persons in the mystery of the Incarnation. By her words, “be it done to me” she became the co-cause of the sanctification of human flesh: “No one is filled with the knowledge of God except through you, All-Holy One. 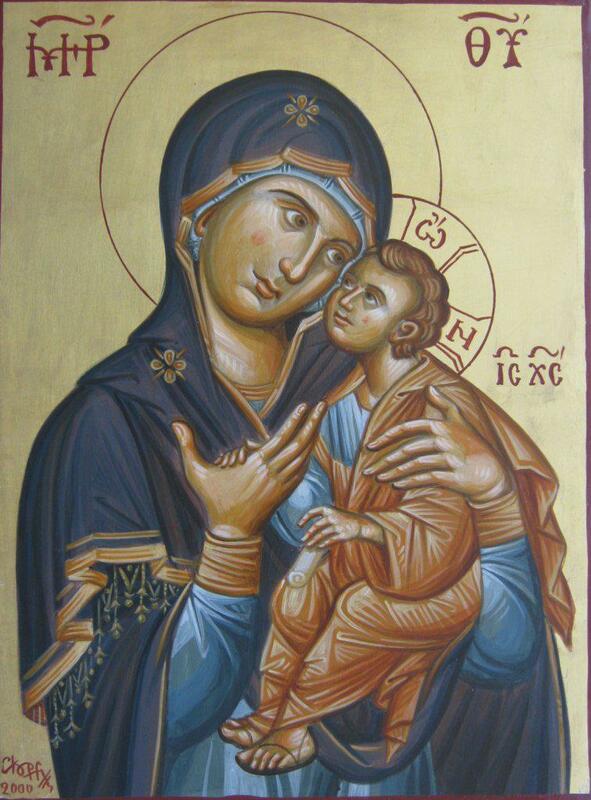 No one is saved but through you, O Theotokos. No one is delivered from danger but through you, O Virgin Mother. No one is redeemed but through you, O Mother of God. No one receives the gift of mercy but through you who contained God” (St. Germanus, Patriarch of Constantinople, Second Homily on the Dormition, MPG 98, 349B, C.). For “In birthgiving, you preserved virginity, and in dormition you did not abandon the world, O Theotokos” (Apolytikion (Dismissal) hymn of the Dormition Feast). It is natural, then, for the body of the Church to sing, “For it is you whom I have as Mediatress before the man-loving God” (An Exapostilarion Hymn in the Service of Supplication in the Dormition fast period). And the faithful pledge to her, “We shall never silence our speaking of your powers, O Theotokos” (A Troparion Hymn of the Small Supplicatory (Paraklesis) Canon). Her mediation and Christ’s mediation operate as one in an unceasing, indivisible synergy in Heaven and in the world. Therefore, she remits sins, intercedes, saves, heals, enlightens, sanctifies, guides, protects; she routs demons and barbarian hordes, delivers us from dangers, turns tides, calms storms. A profound vesper hymn clearly distinguishes the unique nature of the intercessions of the Theotokos: “Unveil to us the boundless sea of your mercy and goodness and thereby wash away our sins, O All-Blameless One, for as the Mother of God you have authority over creation, and by your power you bring all things to pass according to your will. For the grace of the Holy Spirit clearly abides in you, and unceasingly co-works with you in all things, O All-Blessed One” (Small Vespers, Saturday of the Fourth Tone, Apostichon hymn of the Theotokos). Among the Saints and Angelic hosts, the Theotokos alone, therefore, “has the power to do all that she wills” (Theotokion Hymn on Tuesday of the Plagal First Tone). To her is given “authority over creation,” not merely honorary or titular authority but authority with power. For the vesper hymn tells us she “brings all things to pass” by grace, and not by grace that is occasional or tentative, but by full and “unceasing” grace that abides in her. By unceasing grace, her creaturely energy becomes uncreated, as it were. Like the mystery of the Incarnation, it is the mystery of two persons, one created and one Uncreated, co-working in a synergy that is as a single operation. For no creature is of its own nature “boundless.” Only the uncreated, divine energy is boundless, unfailing, undiminished, inexhaustible, eternally constant. The efficacy of this synergy, therefore, springs from the one power and one rule (or “kingdom”) of the Father, and of the Son, and of the Holy Spirit. An Entry Hymn of the Divine Liturgy invokes her “unchanging mediation” and her “constant protection of Christians.” Elsewhere she is also described as “unresting in intercessions” (Kontakion Hymn of the Dormition), the constant and “ready reception” (Compline prayer to the Theotokos) of all who approach her seeking refuge. © Orthodox Church of Singapore. Premium WordPress Theme.